Buy Bronze Male Statues to give to your winners for your next golf tournament, event, or outing. 4. Your Bronze Male Statues will be produced and shipped followed by a tracking number sent by email. Champion Golfer With Antique Copper Finish. Prevent driving a wedge between you and your honorees at the upcoming golf tournament by securing this Champion Golfer award. This eye-catching item shines with an antique copper finish and is sure to make .. Bronze golfer trophy award. Specify male or female. 13" H.. The vintage golfer on this Golf Award/Trophy features timeless appeal that is sure to spark competitive spirit. Measuring 14"x5 1/2", this trophy boasts a sense of achievement that will impress the winner of any golf tournament. 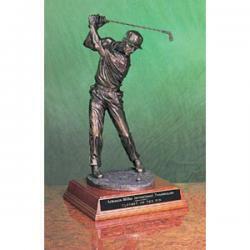 Constructed of bronze and ..
British Golfer Discount Golf Trophies - Golf Tournament Gifts.. Bronze Male Putter Premium Golf Statues - Golf Tournament Gifts.. Custom Logo Bronzed Economic Golf Statues. Resin Golf Awards. From country club competitions to corporate golf events, this Male Golf Figure Award is a surefire way to put your event winners' accomplishments on display. This is the ideal option .. Finished Swing Bronze Custom Etched Golf Statue - Golf Tournament Gifts.. Male Driver Bronze Corporate Golf Statue - Golf Tournament Gifts..
Out of the Bunker Etched Golf Statues - Golf Tournament Gifts..